Here's Émilie Marie Bouchaud, an Algeria-born French singer/actress born in 1874 who went by the stage name Polaire. 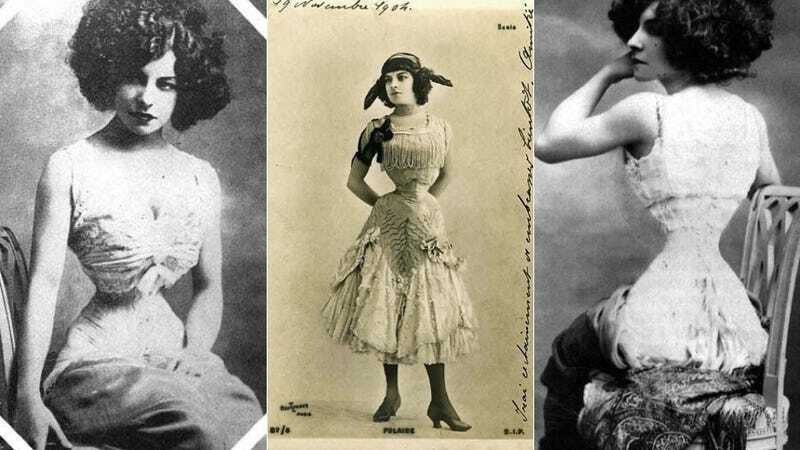 She was apparently 5'3" with a 14-16" waist (via corset, obviously) and a 38" bust. Ka-POW! And you thought Barbie's 39-21-33 was ridiculous; turns out she's a lazy fatty. Good job, Barbie! Not! Polaire also loved extravagant jewels, had a nose-ring, and owned a diamond-collared pet pig named Mimi. She was painted by many artists, including Henri de Toulouse-Lautrec, Antonio de La Gandara, Leonetto Cappiello, and Rupert Carabin. Basically, she's everything you ever wanted to be, except for that whole "having to remove your ribs to fit into her clothes" thing.